The city of Indianapolis is known as the crossroads of America, due to the fact that most travelers crossing the United States will at some point pass through the city. 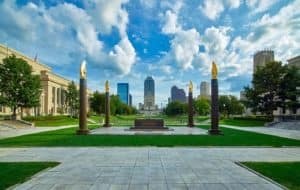 Even though it serves as the main throughway, Indianapolis has many unique attractions and hidden gems that are worth stopping off the highway to visit. Whether you plan on passing through the city or live nearby, be sure to check out some of these amazing stops you will find along the way. Learn about the military history of the state of Indiana at the Indiana War Memorial Museum. You will find exhibits featuring the numerous battles fought in the area, including the famous Battle of Tippecanoe, an 1811 skirmish between American soldiers and the forces of Shawnee leader Tecumseh. You can check out some of the many military uniforms and firearms and stop by a favorite attraction, the USS Indianapolis gallery, which is dedicated to the Portland-class heavy cruiser that was sunk during World War II. Visitors can also stop in to see an AH-1 Cobra attack helicopter and hundreds of photos and documents. Bring the whole family and come as often as you like as the museum offers free admission. Many visitors and locals will cross the City Market day in and day out with many not knowing the amazing catacomb structure that lies beneath their feet. The catacombs are tunnels of brick and limestone that were once used by shop owners in the days before refrigeration to transport and store meats and other food products that needed to remain cool. Due to preservation efforts, many of the original catacombs have stayed intact, making it a unique place to stop and visit. Whether you are a history buff who enjoys the stories of the famous bank robbers of the Great Depression era or are just someone who has seen John Dillinger portrayed on the big screen, paying a visit to check out the famous robber’s final resting place at Crown Hill Cemetery on the city’s north side is something you should put on your Indianapolis itinerary. Though you won’t be able to see it from the site, Dillinger’s grave is unique in the fact that he is buried beneath concrete and iron to prevent souvenir hunters from desecrating his remains. Housed a the building formerly called Central State Hospital for the Insane, the Indiana Medical History Museum features vintage instruments, photos, and a recreated doctor’s office from over 100 years ago. The museum is also complete with an 1896 medical amphitheater and autopsy room. Stop in for a guided tour but make sure to pay a visit to the apothecary garden on the grounds before you depart. Known as one of the most fascinating and unusual museums in the United States, it should be a must stop on any visitor’s itinerary. Make sure to stop by one or all of these hidden gems when visiting the city of Indianapolis and you won’t be disappointed. Whether you enjoy history, adventure, or even the unusual, you can find something to pique your interest in the city.